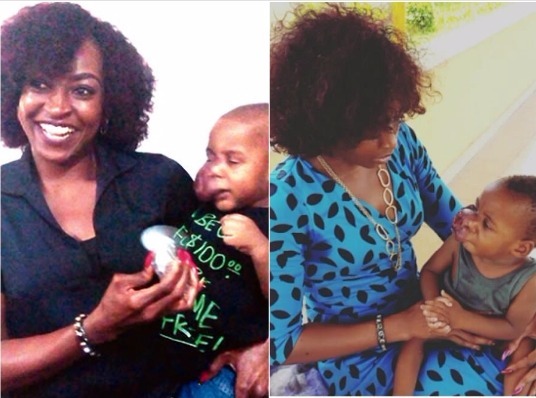 The family of Michael Alvarez, a two-year-old child diagnosed with “Ulcerated Infantile Haemangioma”, has accused Nollywood actress, Kate Henshaw, and Project Alert, a non-governmental organization, of misinformation and a “deliberate campaign of calumny” over funds raised for the treatment of the disorder. Ms. Henshaw and the NGO had come to the child’s rescue, last year, and had begun soliciting for funds from the public for treatment. The family particularly described the actions of the NGO as “malicious and dubious.”“They, however, forgot to understand the full legal implications of soliciting for funds for the care of a minor,” the statement, issued on Friday, said.“It is, therefore, the desire of the family to work with any other nongovernmental organization with a similar objective in a view to use the public funds already raised to take care of Baby Michael as that is the primary reason for the funds raised. Ms. Henshaw had, through Project Alert, intervened to help save Baby Michael’s life after seeking and obtaining the family’s consent early last year. “It must be said that the family and Project Alert enjoyed a cordial working relationship in admitting Baby Michael to Lagos University Teaching Hospital until the medical staff of LUTH embarked on industrial action sometime in June 2016,” the child’s family continued. “Consequently, Baby Michael was moved, along with his grandmother, to Project Alert’s shelter at 21 Akinsanya Street, off Isheri Road, Berger, Lagos. Mrs. Chukwuma said they had already begun contacting those who donated money for the child’s treatment for their refund. “People have contacted us and we are collating the requests in preparation to start refunding,” she said. While denying claims of a promise to treat the child abroad, Mrs. Chukwuma said the first five weeks of the boy’s stay in hospital were solely paid by Ms. Henshaw. “How could Kate promise treating the child abroad when she didn’t know exactly what was wrong with the boy and had not thought at the time there would even be a need to do public fundraising?“They said they contacted a hospital in India that gave them a N12 million bill and they showed us. Lies. Even their first lawyer, Bisuga & Co. can attest to that. We had a meeting with them in November 2016 and Beacon Solicitors is their third lawyer. “They said we refused to continue Baby Michael’s medical treatment. Lies. She (Syndi) asked both the Social Welfare and Project Alert to back off, just because based on the medical report from a consultant at LUTH, the Social Welfare went visiting their home at Ikorodu and decided to place the boy in an orphanage for a period of time to help monitor and ensure good hygiene and strict adherence to his medical needs,” Mrs. Chukwuma said.